From the window boxes spilling with geraniums to the jasmine twining over the picket fence, this Carmel home oozes with charm. 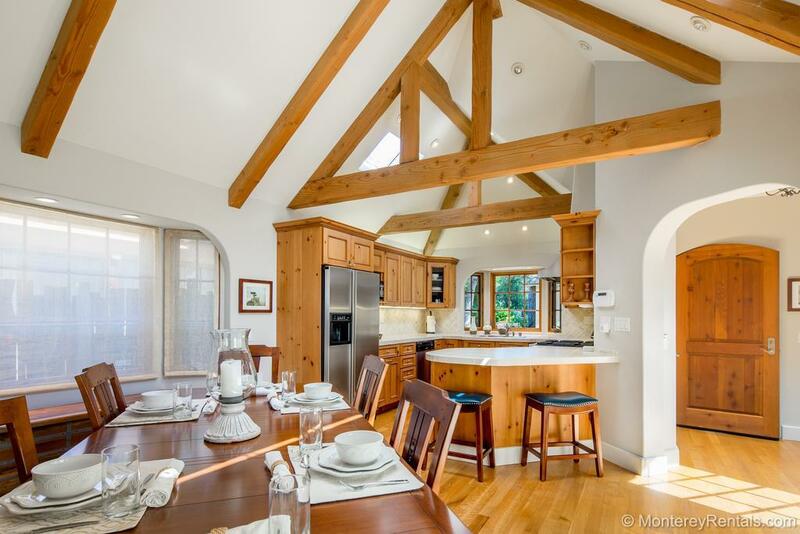 In fact, you’ll have trouble deciding which is more inviting: the living room, with a 55" TV, fireplace and French doors opening to the patio—or the open kitchen/dining room with high ceilings, a skylight, rough-hewn rafters and a second fireplace. If ever a bedroom suite deserved to be called “restful” it is the serene master upstairs. Decorated in soft blues and dove grey, it features a King bed, a third fireplace, a wall mount TV, and access to a Juliette balcony overlooking the courtyard below. Lined in travertine, the adjoining master bath has a jetted tub/shower, dual sinks and a separate toilet compartment. Downstairs, one guestroom features a sophisticated black and white decor with a Queen bed and French doors. A smaller guest room with a Queen-sized bed and a window seat is on the right; a full bath with a tub/shower lies in between. Located on a quiet street, this home has everything you dream of when you think of Carmel: the charm of the past with all the modern conveniences today's traveller's expect. From the natural stone and custom woodwork to the elegant lighting fixtures, you'll be very happy to call this “castle” your home. Explore Carmel Beach, where sugar white sands curve around an emerald bay. Browse galleries and boutiques, sip espresso at a downtown cafe, dine at one of Carmel's many excellent restaurants... and when it's time to come home, light a fire in one of three fireplaces. And when you're not exploring the town's storybook charms, hop on Highway One: you're minutes away from Pebble Beach, Big Sur, the Monterey Aquarium, Fisherman's Wharf and Cannery Row. House wraps around a private protected patio with a barbecue. New furniture, flat screen TV, a fireplace and French doors to the patio. Behind a garden gate, tucked away on a quiet Carmel street. Master bath upstairs has a jetted tub/shower and a private toilet compartment.